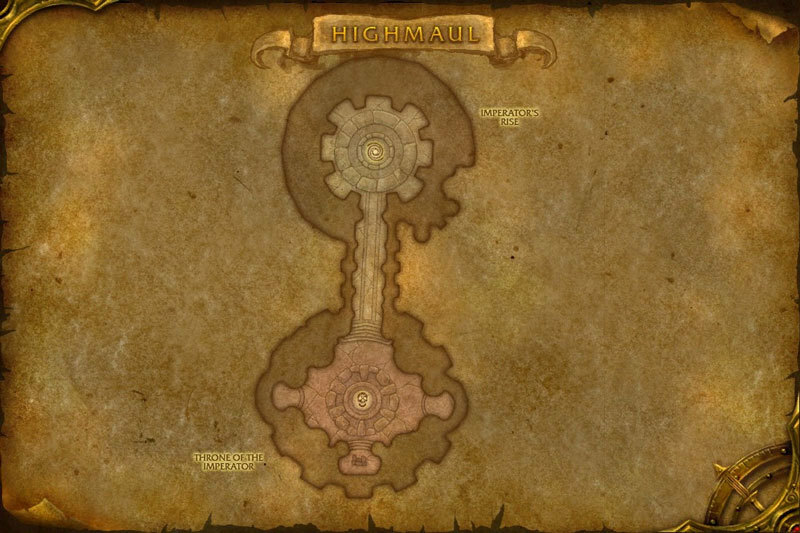 This guide covers the third and final wing of the LFR version of the Highmaul raid instance, The Imperator’s Rise. This last wing has only a single boss in it, the last boss of the raid, Imperator Mar’gok. Don’t worry though the fight deserves it’s own wing as it is a long, complicated, and involved encounter. This last encounter of the raid is a long one, worthy of a final raid boss. The encounter is made up of five different phases! Mar’gok will target random players with Arcane Wrath which deals damage to them and places the Branded debuff on that player. Branded lasts for 4 seconds and then explodes dealing arcane damage to themselves and then jumps to a nearby player and gains a stack so that it deals more damage. Each stack boosts the damage that it does but also halves the distance that it can jump. The range starts at 200 yards, but quickly drops to a manageable distance (200, 100, 50, 25, 12.5, 6.25, etc). Players need to make sure that they are moving away from other players by the time it gets to 4 stacks so that it will not bounce past 5 or 6 stacks. Random players will be targeted with Destructive Resonance several times a minute, which will create an explosive rune on the ground under their feet. The rune takes a few seconds to activate, so you will have time to get out. The rune sill stay active for roughly a minute and if anyone steps in it, it will explode dealing damage to everyone in the raid and given them a debuff that will cause them to be stunned every time they take arcane damage. Needless to say, don’t step in them or your fight will be pretty rough. The tanks will be busy due to two mechanics, firstly the Arcane Aberrations that get summoned will need to be picked up by the off tank and killed by DPS quickly so that it’s AOE does not become an issue. Secondly, when Mar’gok uses his Mark of Chaos ability the tanks must swap quickly and the marked tank needs to run. The mark lasts for 8 seconds and will then explode causing enough damage to significantly hurt or even kill any non-tank player within a very large 35 yard range. The last of the basic mechanics that Mar’gok will be using adds even more complications to all the movement involved in the fight. Mar’gok will occasionally summon a Force Nova which is a ring that expands outwards dealing damage to everyone it passes through. The ring can hit players multiple times if you are moving in the same direction that it is, therefore you need to make sure that you shift directions if you are moving and move towards it and through it quickly so that you are only hit once. The first phase of the fight lasts until you have dropped Mar’gok to 90% health, at which point phase 2 will start. In this second phase Mar’gok will gain the Power of Displacement buff which boosts the power of all of his basic abilities described from phase 1. Branded players are now limited in their movement, making it harder to get away from everyone else. Destructive Resonance is now twice as large, making them harder to avoid and taking up more space. The Arcane Aberrations gain an AOE knockback on death, making them harder to deal with, as they have the potential to knock players into the destructive resonances in the area. Mark of Chaos teleports the affected tank to a random players location, meaning that the off-tank must pick up the boss extremely quickly, and the affected tank must figure out where they are and find a safe path away from players fast! Lastly the force nova will now push players with it, trying to keep them in it and taking damage longer. Players must use speed boosts or damage reductions and run straight through it to prevent getting hit multiple times. This second phase lasts until Mar’gok has been dropped to 55% health, at which point phase 3 will start. This third phase is one that will repeat again later. During this phase Mar’gok will become immune to damage and you will have to deal several adds. There will be Volatile Anomalies and Gorian Warmages. The Volatile Anomalies buff the Warmages if they are close to them so they need to be tanked away from them, and they also explode dealing heavy damage to everyone when they die. The two Gorian Warmages will each fixate on a random player and cast an AOE explosion ability at them called Nether Blast. Targeted players need to get away from the rest of the raid to minimize damage. DPS needs to focus on and kill the warmages one at a time, and then move onto the anomalies. However, since the raid damage from each anomaly is significant, you will need to pause between killing them to allow the healers to catch up. This phase lasts until Mar’gok finishes drawing power from the runestone. In this phase Mar’gok will gain the Power of Fortification buff to replace his Power of Displacement buff from phase 2. Once again this buff boosts the power of all of his basic abilities that were described in phase 1. When the brand jumps from player to player it now only loses 25% of the range of the next jump (200, 150, 112.5, 84.3, 63.2, 47.5, 35.6, 26.7, 20, 15, 11.3, etc). As you can see from the ranges it will take many more stacks before you can stop it from jumping and therefore players affected will take much more damage. Destructive Resonance will now last for 2 minutes instead of 1. The Volatile Anomalies can no longer be stunned or CC’ed and have additional health. Mark of Chaos will now root the tank in place, meaning that the raid will now need to move away quickly instead. Lastly Force Nova will come in waves of three rings, meaning players will take significantly more damage. Once Mar’gok is lowered to 25% health the fight will return to phase 3, with a slight twist. This phase is the same as phase 3 above, but also features a new add called the Gorian Reaver. This new add has a frontal AOE cone that makes tanks face him away from the raid or cause significant damage to the raid. They also have a Kick to the Face ability that forces a tank swap by pushing the current tank away and dropping all threat from them. This phase is otherwise dealt with in the same way as the first time you encountered it. Deal with the Warmages, then the Reaver and Anomalies in whichever order you feel like. The Reaver is generally best to kill before the anomalies since the Kick in the Face knock back deals significant damage to the tank and a badly time anomaly kill at the same time could kill off a tank. In this last phase Mar’gok will gain the Power of Replication buff to replace the Power of Fortification buff from phase 4. Once again this buff boosts the power of all of his basic abilities that were described in phase 1. The brand will now jump to two players the first time that it jumps, making it even more difficult to ensure everyone clears out, and makes it harder to heal through. Destructive Resonance will now create 2 additional new copies of itself when it expires or is triggered. This will make the entire room will up over time and forms a soft enrage mechanic. The Arcane Aberrations will spawn 7 smaller versions of themselves called Arcane Remnants when they die, meaning tanks need to hold more enemies and DPS must spend more time DPSing targets other than the boss. The Mark of Chaos on the tank will create several orbs around the tank when it expires that move in straight lines outwards, dealing damage to anyone that they hit. Lastly the Force Nova will now debuff players to reflect damage to nearby players. This makes the melee group take significant damage, and some players may need to move away or use survival cooldowns. Ranged players are generally unaffected much as long as they are not stacked. This phase lasts until you have defeated Mar’gok or died in the attempt. As you can see from the strategy tips above, the fight is long, complicated, and intense. In the LFR version of this fight damage is significantly lower than in the normal and heroic versions, and therefore groups will still stand a very good chance of beating it. This fight is truly worthy of being a final boss encounter in a raid though due to the varied phases and mechanics, and is an encounter that will take some real effort to defeat in any mode other than LFR.